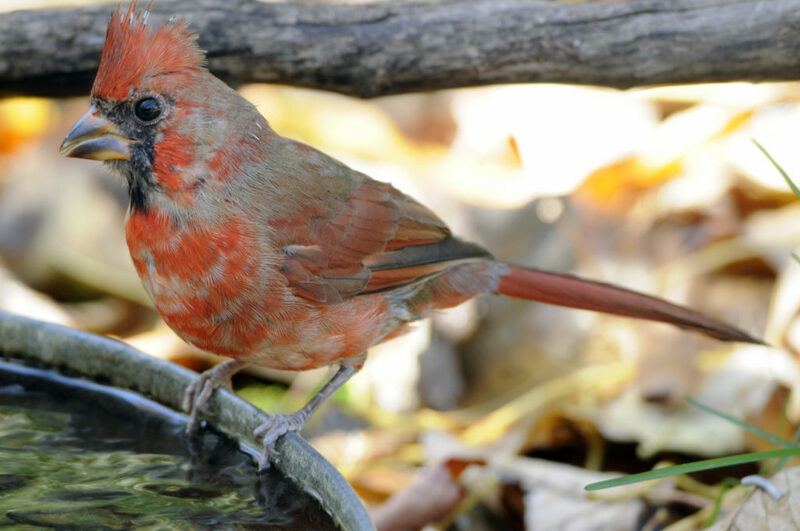 An adult male cardinal swallows a drink of water at a heated bird bath. Photos by Roy Lukes. 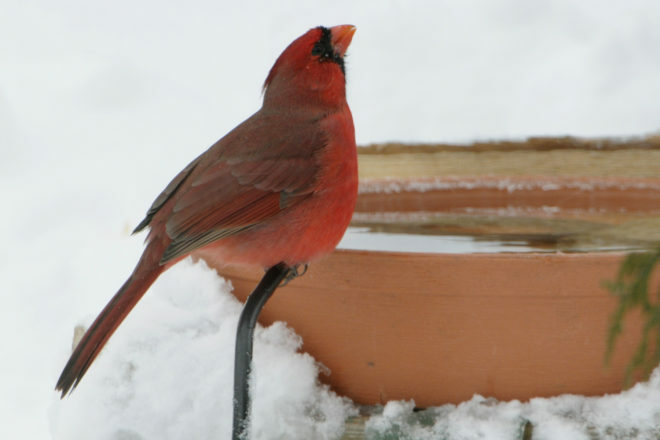 A recent inquiry came from a friend who lives just north of Sturgeon Bay saying that she’d heard the song of a cardinal and wondered whether it was a sign of spring. I answered telling her that it certainly could be – but remember what happened last year when winter returned in April. The male cardinal often begins his courtship by singing, usually on a clear day, in late January or early February as the hours of daylight increase and the sun rises higher in the sky. Two species of permanent-resident birds in Wisconsin have the longest breeding periods. They are the mourning dove and the cardinal. Some members of each species might migrate, but many can be found here in all seasons. Mourning doves begin their nests as early as March. In fact, during the 1995 to 2000 Breeding Bird Atlas project, the first nest with eggs was found on March 10. And the doves can have up to five broods in a year. Cardinals have been recorded starting nest-building as early as March 20 in Wisconsin. Both species have greater nesting distribution in the southern half of the state. I remember seeing young cardinals in mid-September during the years when we lived in The Ridges’ range light house. You can easily identify a fledgling cardinal by its brown plumage, but especially by its brown beak. The red beak color doesn’t develop until the birds are about six months of age. This immature male cardinal still has brown in its beak as its fledgling brown feathers change to red. It is comical to see the cardinal as a symbol of several sports teams in America. Often it is designed on the uniforms or the helmets of the football team as a red bird with a yellow beak! In fact, one team shows that the angry, snarling bird even has teeth in its yellow beak! But I digress. When the weather is mild, and we have a warm early spring, a normal summer and a warmer-than-average autumn, the cardinals can have three broods in our area. In the southern part of the United States, they may have four broods. Cardinals are much more abundant in the south and central parts of the United States. In fact, they were chosen as the official bird of Illinois, Indiana, Kentucky, North Carolina, Ohio, Virginia and West Virginia. That is a symbol of how popular and beloved the species has become. Their scientific name, Cardinalis cardinalis, comes from Latin and means “important.” The cardinal received its name from someone who recognized the importance of the cardinals in the Roman Catholic Church, in which these officials wear flowing, bright-red robes. This spectacular bird has been documented to nest in nearly all of the 72 counties in Wisconsin, with the exception of six or seven far-northern counties. They are most abundant in the southwestern sections of the state. Cardinals’ preferred breeding habitat is dense shrubs, thickets, undergrowth, thick tangles and vines in shrubs, small trees and streamside woodlands. They seem to like wooded edges, and their original pathways into our state were along rivers at the Illinois border. A report written in a bird-club newsletter back in 1903 called for members to be on the watch for the “cardinal grosbeak,” as it was called at that time. They were very rare, and it was noted that a few were seen in the extreme southern part of Wisconsin. It is strange to realize, but the female does do some singing – usually after the male establishes a territory, but before nesting starts. It probably reinforces the pair bond. I have occasionally seen a male feeding the female a sunflower seed as part of the mating ritual. It appears to show that he will be a good provider of food for her while she is on the nest, and for the young after they have hatched. The female builds the nest, which sits, on average, three to six feet above the ground, but it can be much higher. The nest is compact and constructed with small twigs, weed stems, strips of bark, grasses, rootlets, dried leaves and lined with fine grass and hair. The eggs are one inch long and bluish to greenish-white in color, marked all over with brown, gray or purple areas. The clutch averages three to four eggs, but it can range from two to five. Incubation is done by the female and takes 12 to 13 days to hatching. Then the helpless young are fed in the nest by both adults for another nine or 10 days before they fledge. A captive cardinal lived to the age of 22 – much longer than the average wild cardinal, whose record is 15 years and nine months. Federally licensed bird banders (Roy was one for more than 20 years) help create these statistics through the data they collect for each banded bird and from the recoveries of birds banded years ago. The northern cardinal was introduced to Hawaii in 1929 and now is common on all of the islands. Both the mourning dove and the cardinal have benefited and show range expansion due to more people feeding birds at their homes. Two other species that have also benefited are the tufted titmouse, seen only rarely in Door County, and the red-bellied woodpecker. Valentine’s Day is associated with the color red. That makes the cardinal a good bird for the holiday, especially if you hear one singing on the next sunny day!